Sensational crime drama about a narcotics agent at odds with a corrupt American cop. They’re investigating the murder of a couple after driving their car across the Mexican-American border. 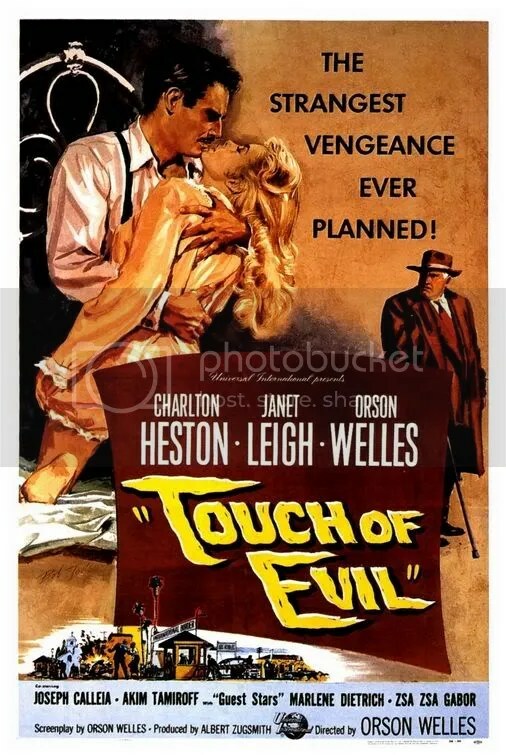 A B-movie at heart, this film noir is a potboiler dressed up with flashy camerawork and a stellar cast. Written, directed by, and co-starring Orson Welles, he flaunts conspicuous direction and stunning visual style. This is exaggerated stuff, but damn if it isn’t entertaining. Dennis Weaver plays a jittery hotel manager, Marlene Dietrich dons a black wig as a fortune telling madam, and they’ve got Charlton Heston playing a Mexican! When a gang of hoodlums terrorizes Janet Leigh in a hotel room, the scene threatens to derail the film into trashy melodrama. Luckily the plot is so arresting it holds the viewer’s interest throughout the film until the very last frame of this tense psychological thriller. This entry was posted on April 17, 2010 at 8:00 pm and is filed under Crime, Film Noir, Mystery, Thriller with tags 1958. You can follow any responses to this entry through the RSS 2.0 feed. You can leave a response, or trackback from your own site. Maybe it would have helped a little if the director had been willing to admit he needed SOMEbody around to keep him from letting the dialog, the voice inflections, the camera angles and every other darn thing be so relentlessly self-conscious. Charlton Heston could at least have asked his pal, Cecil B. DeMille, to visit the set. But would he have been allowed in?